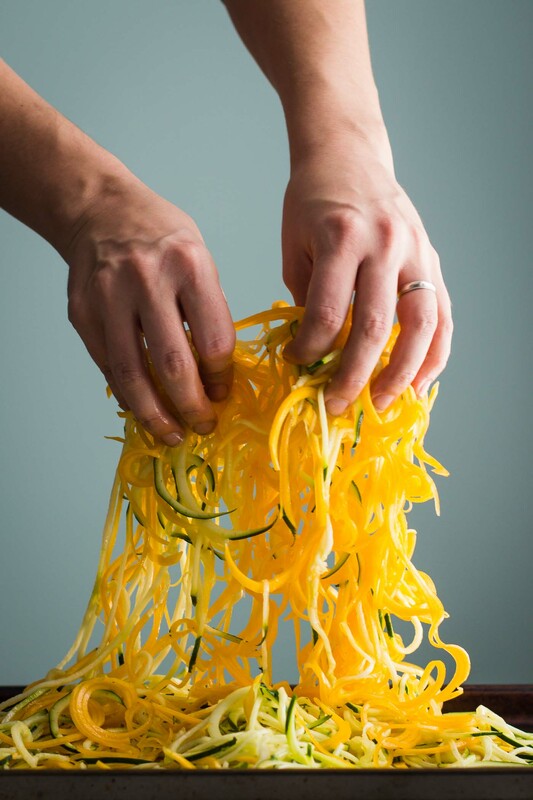 I’ve been spiralizing the heck out of some veggies lately! 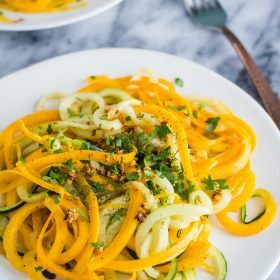 As I’ve mentioned before, I finally got a new spiralizer to replace the crappy and cheap spiralizer that I used to have. My new one is THIS one and I LOVE it. 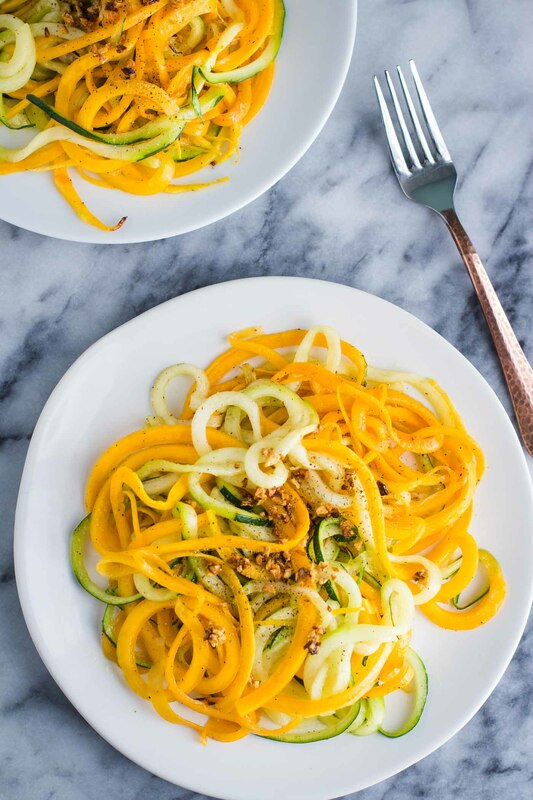 Coincidentally, in case you’re not aware, the creator of that spiralizer has a super awesome food blog called Inspiralized where she shares ALL kinds of great spiralizer recipes. Needless to say (but I will anyways), I’m a pretty big fan. I’ve yet to actually get the Inspiralized cookbook but it’s on my wish list! You know what else is on my wish list?? BEES! ???????????????? I told myself that I would wait a couple years before getting them BUT I’m probably going to do it this year :D Nashville has a really hands on mentor program which makes me feel a lot more confident that I won’t just accidentally kill the bees in a week. Because at the end of the day, I know very little about caring for a bee hive. I’m working on a pretty big garden this year and I plan to put the bees by that for this year. Then in the next year or two, I plan to plant a rather extensive flower garden in a currently unoccupied section of our yard. I figure the bee hive will move to the flower garden once it exists. I have big BIG plans for my >2 acre yard ???????????????????????? 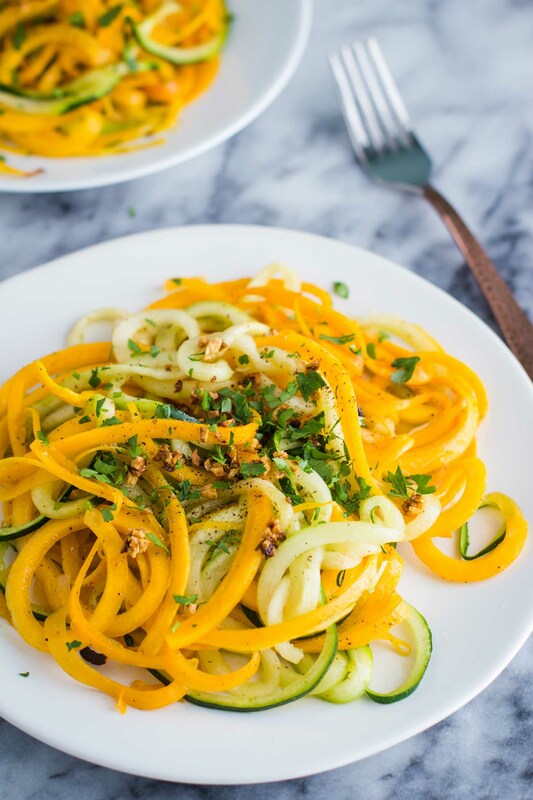 And of the things that I will be growing this summer, basically all of the ingredients to make this dish are on my list: garlic, parsley, zucchini, and butternut squash! I’m really longing for summer days where half of my diet consists of fruits and veggies and eggs picked straight from my backyard. So, here soon I’ll be making a big ole plate of this Garlic Herb Spiralized Veggies with fresh veggies and herbs from my garden. 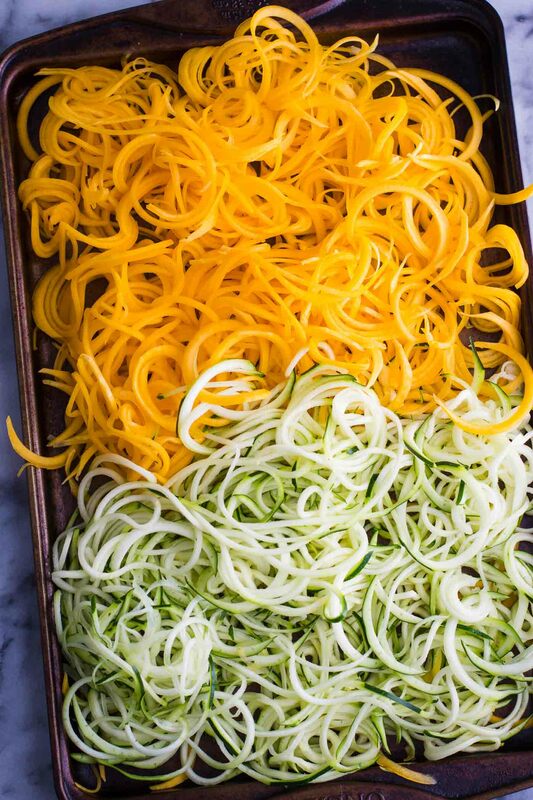 I’m a big fan of roasting my spiralized veggie noodles but they can also be cooked in a large skillet. I typically stack all of the veggie noodles up on a baking tray and then toss them with a bit of oil (I’ve been REALLY into this avocado oil lately) and then sprinkle S&P and a bit of other spices on them. While the veggies are roasting, some fresh parsley is chopped and some garlic is sautéed. I went for crispy garlic on this one just to add a nice textural element to the dish. I’m a pretty big fan! once everything is done, we just toss it together and serve. A bit of parmesan cheese goes a LONG way on these noodles as well. If you’re looking for a vegan option, you can try THIS from amazon or even make your own using THIS recipe. 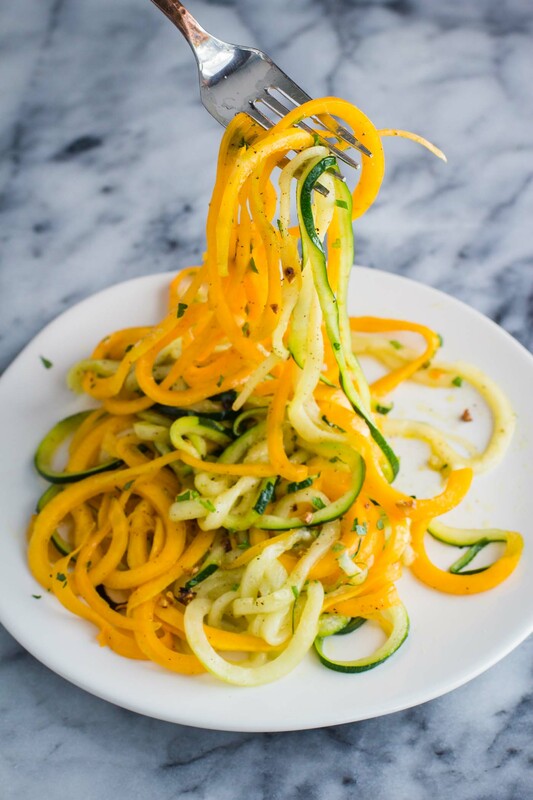 I hope you’re spiralizing your veggies on a regular basis because it makes for a wonderful meal!! 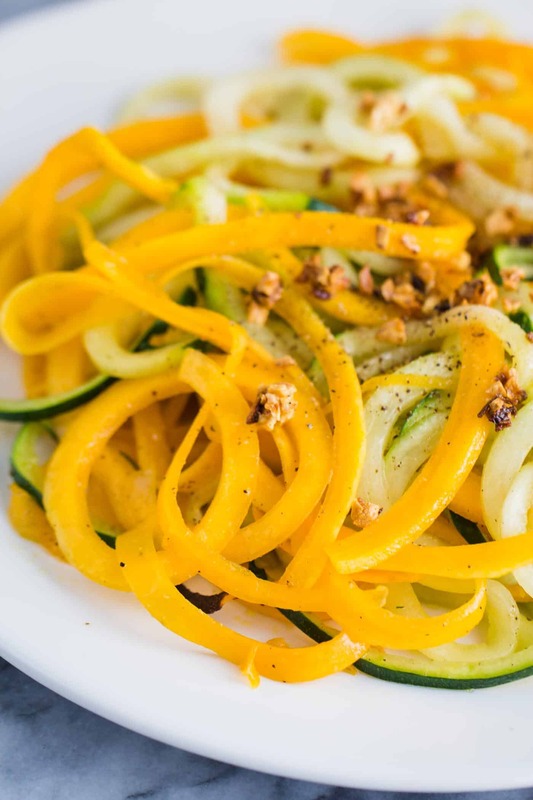 On a large baking tray, toss the butternut squash and zucchini noodles in about 2 tablespoons of oil. Sprinkle with a generous amount of salt and pepper. Bake for 20 minutes or until the noodles are at your desired tenderness. When the noodles are nearly ready to take out of the oven, start the garlic by sautéing it in 1 tablespoon of oil over medium low heat. For the crispy garlic, continue to sauté it, stirring frequently, until it begins to take on a dark brown color–BUT be careful not to burn it! Once done, take off of heat and let cool slightly. Once the noodles are out of the oven and have cooled for a couple minutes, toss in the parsley and garlic and parmesan (if using). Sprinkle on a bit more salt and pepper if desired and serve hot.